The 56th BFI London Film Festival continues, and we have some mini reviews for Ben Affleck's tense new drama 'Argo', the Salman Rushdie adapted 'Midnight's Children', and 60s girl group musical 'The Sapphires'. In particular, 'Argo' looks to set to be one of the highlights of this year's LFF. I think it's fair to say that few would have predicted Ben Affleck's rise as one of the most exciting filmmakers working today. Affleck follows his acclaimed previous directorial efforts 'Gone Baby Gone' and 'The Town' with 'Argo' - a film based on the true story of a 1979 CIA rescue in hostile Iran that saw six embassy workers pose as a film production crew. 'Argo' opens with an animated sequence before immediately dropping the viewer into a tense, potentially riotous situation as angry Iranians seek to siege the US embassy in Tehran. Affleck captures the fear of the situation impeccably, while the ensemble cast (featuring the likes of Alan Arkin and Bryan Cranston) successfully mix comedic elements with the drama. The dialogue is a little try hard at times but 'Argo' is smart and suspenseful. This faithful adaptation of Salman Rushdie’s 600-page Booker Prize-winning novel of the same name is a sprawling, languid affair, charting the parallel lives of two children swapped at birth: one into privilege, the other into squalor. These two boys are among many children born on the stroke of midnight on the night of India’s independence – all of whom possess unique supernatural abilities. Through this ambitious premise, director Deepa Mehta explores various significant events in India’s history, illustrating the consequences of the many social and political upheavals. While 'Midnight’s Children' is certainly engaging – visually and in terms of performances – it also feels bloated and turgid, with an overly long running time and a ponderous pace that would perhaps have been better suited to a TV serialisation than a feature-length film. 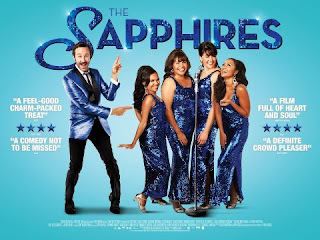 Chris O’Dowd brings his considerable comedic talents to this lively musical rom-com, which relates the true (but almost certainly heavily embellished) story of four feisty Australian Aboriginal girls who form a family girl group – The Sapphires – braving the battlefields of Vietnam to perform for the US troops in a quest for stardom. Effervescent and unapologetically feel-good, 'The Sapphires' teeters on the edge of cheese throughout, but has enough charm, laughs and emotional notes to pass muster. The four lead actresses, and Jessica Mauboy in particular, have genuinely phenomenal voices, and the fantastic 1960s soundtrack will be quite a treat for soul music fans – light-hearted, toe-tapping fun. For more info on these 56th BFI London Film Festival screenings and to purchase tickets, head to bfi.org.uk/lff.